In budget 2012 Finance minister has given income tax relief by increasing income tax slab & on other hand grabbed away amount more than this relief by increasing service tax by 2%. Budget 2012 delivered a big dissatisfaction to many due to rise in the service tax and excise duty from 10% to 12%. If you are thinking that you will be able to draw more salary & save more due to income tax relief you are wrong. Defiantly you will see small take home difference but your household expense is about to increase due to rise in service tax. 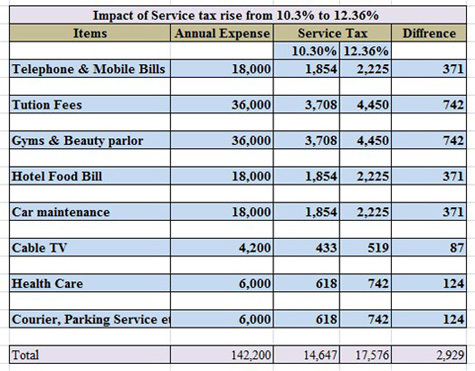 Service tax scope is widen up and covers most of household basket. Only 17 like essential education, public transport and services meant for agriculture, are now exempted from this tax bracket. Let’s check how this rise in service tax affects your budget. In above example we have made certain assumption of annual expense, you can download “Service Tax Impact Excel Sheet” and calculate actual impact of this rise on your household budget. Even to insure your life you have to pay more money. 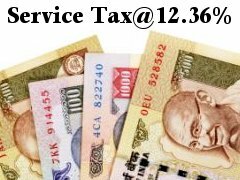 Service tax on the gross premium for the first year has been hiked from 1.5% to 3%, while subsequent premiums will be taxed at 1.5%. Exemption of amount Rs 5,000 is given on preventive health checkup but on other hand much more amount is taken from your pocket, every visit to doctor & every diagnostic test will be cost you more due to increase in service tax liabilities. 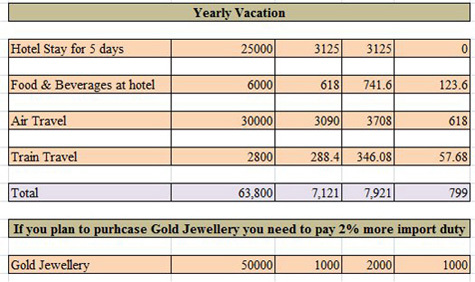 Even hike in excise duty and custom duty is goanna rise your expense as most of manufacturer will pass these tax expense to customer. Be prepared to pay more on everything starting from cigarettes and branded cloths to car and imported items. Guru Mantra for this year is to spend minimum on services to control your household expense. Service tax widening is a welcome step. However, this rise will bring inflationary effect. Let us see 17 services which are exempted from service tax. 1. Electricity & Gas: For local utility bill you need not to pay service tax. We already pay other taxes on it. 2. Residential rent: House rent for residential purpose will not attract any service tax. 4. Services by the Reserve Bank of India. 6. Manufacturing of goods Service Tax is not applicable but there is already the excise duty, customs duty and VAT on this. 7. Foreign consulates and embassies in India. 9. Advertisements on hoardings or newspapers If you are planning to give advertisement on TV or Radio still service tax is applicable. 10. Toll Tax: Ever thought of giving tax on tax? If service tax is applied on toll @ 12.36 % imagine paying Rs.22.40 (waiting for change) at toll both with lots of cars waiting behind you. 11. Gambling: Yes you need not to pay service tax on gambling, if you buy a lottery ticket or bet on a horse race you need not to pay service tax. But if you win, you need to pay income tax. 12. Entertainment events: Ticket on any entertainment events like amusement park will not attract any service tax. 13. Education: No service tax for pre-school to high-school education & higher education but yes you need to pay tax on tuition fees. 14. Certain financial transactions like giving money as a loan, buying a deposit, where interest is involved will not be chargeable to service tax. 15. Public Transport: Exemption applies to all kinds of transportation, on water or land, including metered cabs. Please remember you will pay service tax on air fare and on First Class or any air-conditioned coach seats in a train. And you will pay it on packaged tours. 16. Goods transport: Except if you use a road transport agency or a courier service. 17. The End: This includes funeral, mortuary related services. This tax burden may kill you; but once you are gone no service tax, sales tax, income tax is applicable at the end.